A stroll through the research literature on shyness can be a little alarming to the parent of a wallflower. Studies have linked behavioral inhibition in children — a trait referring not only to shyness but also to extreme caution about new situations — with an increased chance of developing anxiety disorders later. And research suggests that the parental urge to protect a cautious kid may make matters worse. But psychologists and child development specialists have also come up with ways to support shy kids. The key, said Sandee McClowry, a psychologist at New York University, is to nudge children out of their comfort zones without trying to change their fundamental natures. "That acceptance of the child is a huge, huge thing," McClowry told Live Science. Psychologists define shyness as a tendency to withdraw from social encounters, and a tendency to feel awkward and tense when social interaction does occur. Researchers who study shyness often use the broader concept of behavioral inhibition to capture kids whose anxiety includes both feeling shy around people and also in new situations. But other studies have found ramifications of this wallflower personality. Another 1988 study, which used data from people born in the late 1920s, found that men who had been shy in childhood were less likely to marry later and have children later, and generally had less stable careers than those who were outgoing. Shy women, on the other hand, were more likely than outgoing women to marry, have children and stay at home. For both men and women, the researchers wrote in the journal Developmental Psychology, the pattern seemed to be a withdrawal from the world. These results might be different today because of changing gender roles. Still, as the researchers wrote, they highlight that a person's temperament can alter the course of their life via the slow accumulation of choices people make and the opportunities they have. More concerning are studies linking behavioral inhibition to later anxiety. A meta-analysis of seven studies published in 2012 Journal of the American Academy of Child & Adolescent Psychiatry found that kids with the most extreme behavioral inhibition were more than seven times more likely to later develop social anxiety disorder than kids without behavioral inhibition. About 15 percent of children show extreme behavioral inhibition, the researchers wrote, and about half of that group will develop social anxiety. "In general in our society, extraversion and being able to speak up and express ideas verbally is valued a lot," said Soo Hyun Rhee, a psychologist at the University of Colorado, who studies the links between child temperament and later mental health problems. Thus, Rhee said, shy kids can slip between the cracks in the classroom and in other situations. For kids with extreme shyness, the American Psychological Association recommends looking for professional help. A therapist can help children (or even adults) come up with strategies for managing their anxieties or choosing activities that fit their temperament. It's easy to want to protect a kid who struggles in new situations, but researchers advise against going too far. In one study that followed kids from age 3 to 6, kids who were behaviorally inhibited at age 3 where more likely to remain behaviorally inhibited at age 6 if their caregivers were overprotective, according to the findings published in August in the Journal of Research in Personality. "You take very, very small, incremental steps and provide a lot of reinforcement," McClowry said. For example, if a kid wants to go to sleep-away camp but is afraid of spending the night away from home, parents might start by having other kids over for a sleepover at their own house, and then move up to a night away at grandma's. Parents should pay attention to the child's comfort level throughout this scaffolding process, and be accepting if the kid hits a limit. Especially with older children, parents can talk through the process, McClowry said: How did the child feel, what helped them feel better, what did they wish they'd done afterwards? 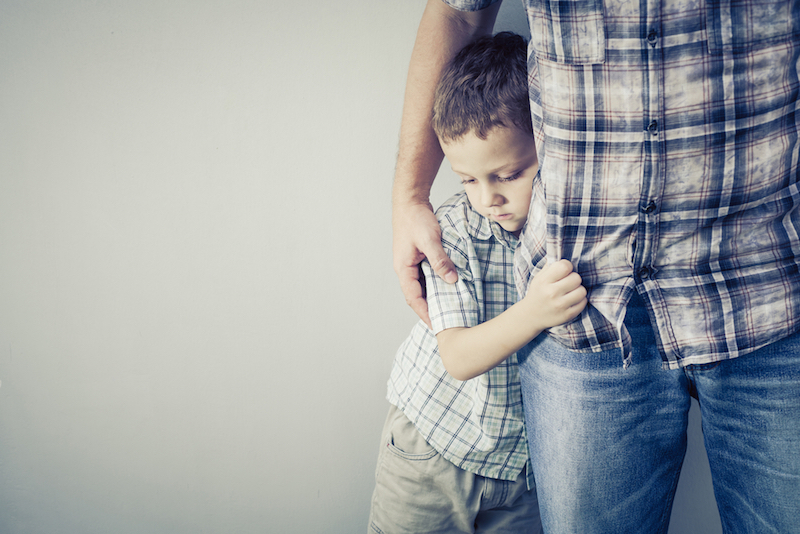 Researchers have also found that parenting that is warm and responsive to a child's needs helps break the link between shyness and potential mental health problems. A 2014 study found that shyness in kids was linked to an increased risk of later anxiety only for children who did not have a secure attachment to their caregivers. Secure attachment refers to a nurturing relationship in which kids feel free to explore but also know they can return to their caregivers for reassurance. The researchers use puppets to teach young children that people have different temperaments (Fredrico the Friendly, Gregory the Grumpy, Hilary the Hard Worker, and Coretta the Cautious), which helps the kids understand why other children might react to situations in different ways. These puppets weren't named on a whim; McClowry and her colleagues created the personas using statistics from a study of the temperaments of 883 school-aged kids. For shy kids, the researchers suggest strategies they can use to push themselves out of their comfort zones. "The goal is to support them in a way that they become socially competent in these kinds of situations that are stressful for them," McClowry said. This kind of support can stave off the risk of anxiety and depression, she said. In a 2014 study of the INSIGHTS program across 22 low-income schools that was published in the journal School Psychology review, McClowry and her colleagues found that all of the children who were randomly assigned to the program saw a boost in academic skills, but shy children benefited the most. Between kindergarten and first grade, shy kids who went through the 10-week program saw their critical thinking skills improve and their math skills hold steady, while shy kids who did not do the program declined in both. That's important, the researchers wrote, because many studies have found that shy children struggle more in school than students who are more outgoing. Part of the problem may simply be that shy kids don't show what they know. In a 2014 study of shy toddlers, Rhee and her colleagues found that behaviorally inhibited kids were perfectly able to understand language, but are much less likely than the outgoing kids to talk (especially with a stranger in a psychology lab). The lesson, Rhee said, is that teachers and other educators need to think of ways to let shy kids shine. "This has made me as a professor more sensitive to people who are shy or inhibited, giving them other opportunities to show they know the material, so having more written assignments and so forth," Rhee said.